Thomas Dunne Books, 9781250069726, 352pp. In 1938, Mercedes-Benz began production of the largest, most luxurious limousine in the world. A machine of frightening power and sinister beauty, the Grosser 770K Model 150 Offener Tourenwagen was 20 feet long, seven feet wide, and tipped the scales at 5 tons. Its supercharged, 230-horsepower engine propelled the beast to speeds over 100 m.p.h. while its occupants reclined on glove-leather seats stuffed with goose down. Armor plated and equipped with hidden compartments for Luger pistols, the 770K was a sumptuous monster with a monstrous patron: Adolph Hitler and the Nazi party. Deployed mainly for propaganda purposes before the war, the hand-built limousines—in which Hitler rode standing in the front seat—motored through elaborate rallies and appeared in countless newsreels, swiftly becoming the Nazi party’s most durable symbol of wealth and power. Had Hitler not so thoroughly dominated the scene with his own megalomania, his opulent limousine could easily have eclipsed him. Most of the 770Ks didn’t make it out of the rubble of World War II. But several of them did. And two of them found their way, secretly and separately, to the United States. 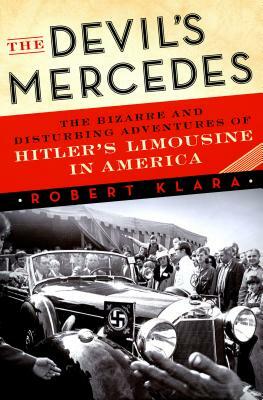 In The Devil’s Mercedes, author Robert Klara uncovers the forgotten story of how Americans responded to these rolling relics of fascism on their soil. The limousines made headlines, drew crowds, made fortunes and ruined lives. What never became public was how both of the cars would ultimately become tangled in a web of confusion, mania, and opportunism, fully entwined in a story of mistaken identity. Nobody knew that the limousine touted as Hitler’s had in fact never belonged to him, while the Mercedes shrugged off as an ordinary staff car—one later abandoned in a warehouse and sold off as government surplus—turned out to be none other than Hitler’s personal automobile. It would take 40 years, a cast of carnies and millionaires, the United States Army, and the sleuthing efforts of an obscure Canadian librarian to bring the entire truth to light. As he recounts this remarkable drama, Klara probes the meaning of these haunting hulks and their power to attract, excite and disgust. The limousines’ appearance collided with an American populous celebrating a victory even as it sought to stay a step ahead of the war’s ghosts. Ultimately, The Devil’s Mercedes isn’t only the story of a rare and notorious car, but what that car taught postwar America about itself. ROBERT KLARA is the author of the critically acclaimed FDR’s Funeral Train and The Hidden White House. His unveiling of the private world of the famous funeral train was hailed as “a major new contribution to U.S. history” by Douglas Brinkley. His second book, a dramatic account of Truman’s fight to save the White House, was called “popular history at its best” (The Christian Science Monitor). His writing has appeared in The New York Times, among other publications.